After a period of scarcity, the vegan, gluten-free and non-GMO beef alternative is back and available in many creative ways. The Beyond the Beyond Burger (foreground) and Seoul Burger (background) are two of the five current takes available at The Street Eatery. Photograph courtesy of The Street Eatery. Alberta may pride itself on top-tier quality beef, but there’s a new kid in town and everyone’s talking about her. The plant-based Beyond Burger is a fully vegan, gluten-free and non-GMO product with more protein than unseasoned beef. Made of ingredients like pea protein, refined coconut oil, potato starch and beet juice extract, the burger’s flavour is remarkably similar to beef and even appears to “bleed” when bitten into. Vegans are smitten, and even meat-loving diners have weighed in favourably. The Beyond Burger was rolled out at nationwide A&W locations on July 9, 2018 and was completely sold out by mid-August. Other restaurants also had a hard time keeping it in stock due to the fever sweeping the burger landscape. A&W and Beyond Meat, the Los Angeles-based manufacturer of Beyond Burgers, assured consumers the product would be back in stock by October 1st. True to their word, an announcement on that very date stated that the Beyond Burger was back “for good” at A&W. With supply problems abated — for now, at least — twists on the Beyond Burger are popping up all around Calgary, including at independent, locally-owned restaurants. 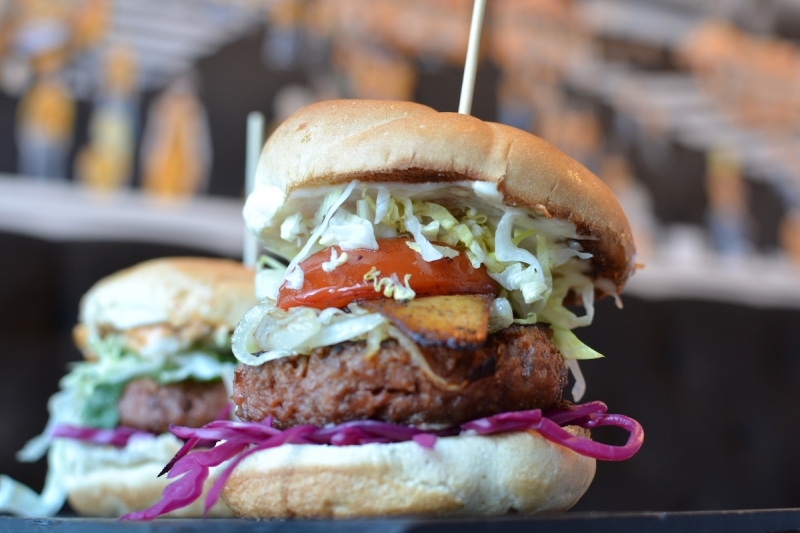 Read on to find out what your Beyond Burger options are in Calgary — where to get them, the unique ways they’ve been prepared and where you can substitute the patty into your existing favourite non-vegan burger. Note: while there has been some discussion whether crops relying heavily on bee-pollination (like avocados, for example) ought to be considered fully vegan, the definition of vegan used in this article will include bee-pollinated crops. The Infinity & Beyond Burger goes for $9.50 at both Boogie’s Burgers locations. Photograph courtesy of Boogie’s Burgers. Boogie’s has always been a paradise of choices with its inventive and diverse list of burger options. 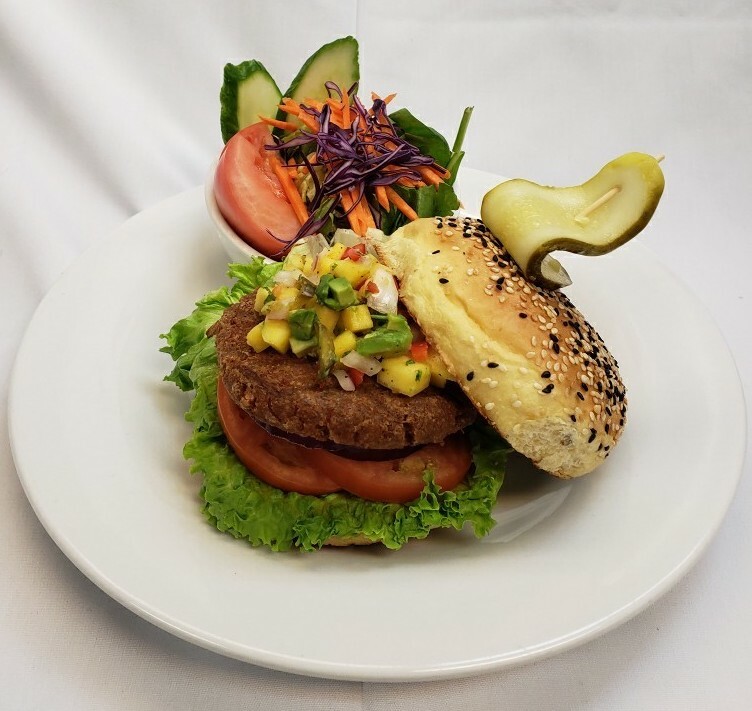 It even creates two different house-made veggie-friendly options: the vegetarian black bean and mushroom patty and the vegan option made with carrots, corn, broccoli and more. Not immune to consumer demand, the restaurant’s two locations both now offer the $9.50 Infinity & Beyond Burger with standard fixings of lettuce, tomato and onion, plus your choice of red sauce, barbecue sauce or spicy barbecue sauce. If veganism isn’t your concern, you can also swap a Beyond Burger patty into one of their signature creations for $3.80, or add an additional Beyond patty for $6. Donna Mac’s twists on fine and comfort foods please meat-eating and vegan diners alike. Its $16 “Mac” Burger uses the Beyond Burger patty, miso-based mayonnaise substitute, vegan cheese, lettuce and pickles to make your plant-based dreams come true. It is available on both the lunch and dinner menus at the restaurant. If you’re a non-vegan and looking for adventure, you can also swap Beyond patties into the $20 double cheeseburger (which has pork belly and dairy-based cheese) for no additional charge, though that burger remains stellar without modification. Enjoy vegan mayo and mango avocado salsa on this creation available at five different Calgary pubs. Photograph courtesy of Calgary’s Best Pubs. Calgary’s Best Pubs restaurant group has five locations that serve the Beyond Burger, in addition to other hearty pub fare. The $18 offering comes with vegan mayo, mango avocado salsa, leaf lettuce, tomato, red onion and your choice of grilled bun (vegan sesame brioche or multi-grain, gluten-free bun available for $2.99). All orders come with your choice of side and you may swap a Beyond patty onto a different burger for no extra fee. This Beyond Burger ($15.50) is pictured with optional “F’acon” ($1.50). Photograph courtesy of Hearts Choices. The fully vegan menu at Hearts Choices includes Thai, Mexican and American-inspired food with various meat substitute creations available. Its $15.50 Beyond Burger is house-seasoned and then topped with caramelized onions, vegan cheese, lettuce, tomato and pickles. It’s served with salad or fries and you can add “F’acon” for $1.50 or make it gluten-free with a carrot bun for $1.85. This item is served at both the Hearts Choices Café in northeast Calgary and The Thai Vegan Café in the southwest. The Ultimate Veggie Burger runs $16 and includes two sides. Photograph courtesy of The Palomino. The Palomino is near the top of our list for where to try the Beyond Burger. 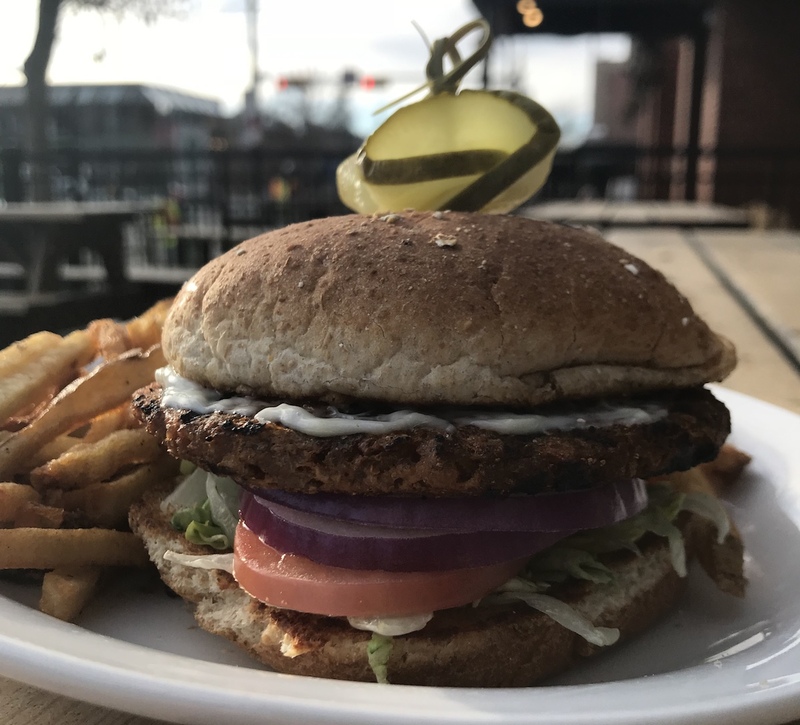 The $16 Ultimate Veggie Burger includes two sides and stars a Beyond Meat patty accompanied by lettuce, onion, tomato, red pepper relish and honey Dijon mayo. Add applewood-smoked cheddar or double-smoked bacon for $2.50. Keep this one vegan by asking for no mayo. This $12 offering from Pin-Bar includes the peppery delight of arugula. Photograph courtesy of Pin-Bar. Pin-Bar’s Beyond Burger ruled 17th Avenue during the great A&W Beyond Burger shortage of 2018. This pinball haven and sandwich bar offers a competitively priced $12 creation featuring onions, pickles, mustard, arugula and tomato. And if you’re considering ordering the non-vegan burger and swapping in a Beyond patty, you’re actually better off just adding cheese and Russian dressing to the Beyond Burger. Not to be confused with the teenage haunt of Riverdale fame, Pop’s Taphouse is a neighbourly pub with crowd-pleasing favourites. Its $17 Beyond Meat Burger comes on a brioche bun with mayo, iceberg lettuce, tomato, pick and onion with a side of your choice — alert your server if you’re vegan and both the bun and mayo will be swapped for vegan alternatives. No patty swaps, please, but add on any extras you like (additional charges apply) to the standard version on the menu. This take on the burger is also served at Pop’s three Lethbridge locations. This $14 Beyond Burger can be enjoyed with a game of soccer or during a raucous game of Punk Rock Bingo. Photograph provided by the Ship & Anchor. This Calgary institution has been around for nearly 30 years and should need no introduction. Its $14 Beyond Burger comes on a multi-grain bun with lettuce, tomato, onion, pickles and (non-vegan) mayo. If the bar is packed, ask for add-ons rather than a switcheroo when it comes to your patty. But if there’s a lull, you can inquire about customizing things further. Bonus: the Ship also carries “ground” Beyond Beef which can be added to nachos for a $5 charge. The $16 Seoul Burger is one of five current Beyond Burger options available at The Street Eatery. Photograph provided by The Street Eatery. 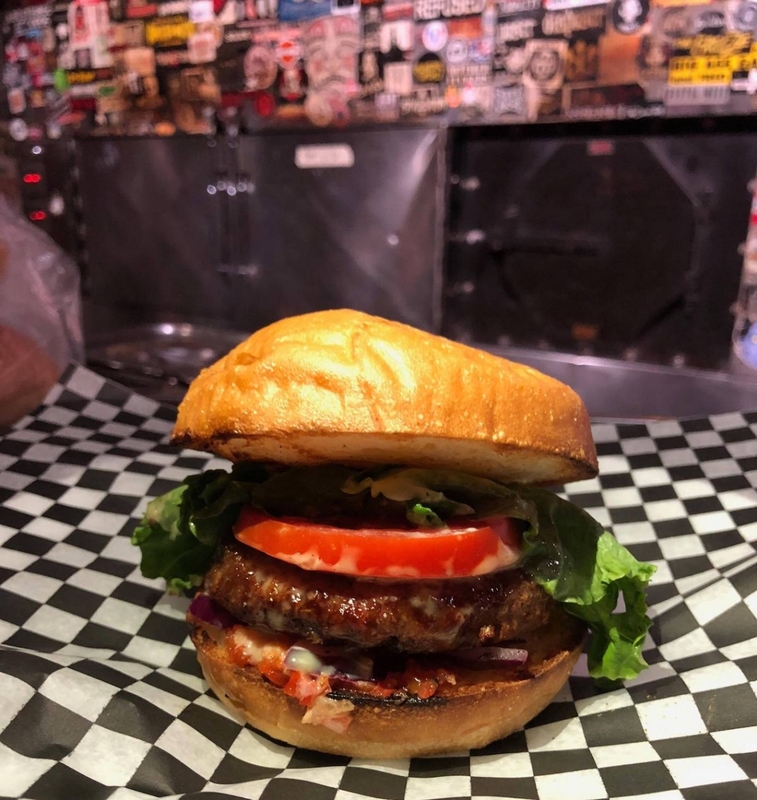 Picky eaters looking for a Beyond Burger should head to the Street Eatery near the 10th Street bridge in downtown Calgary. 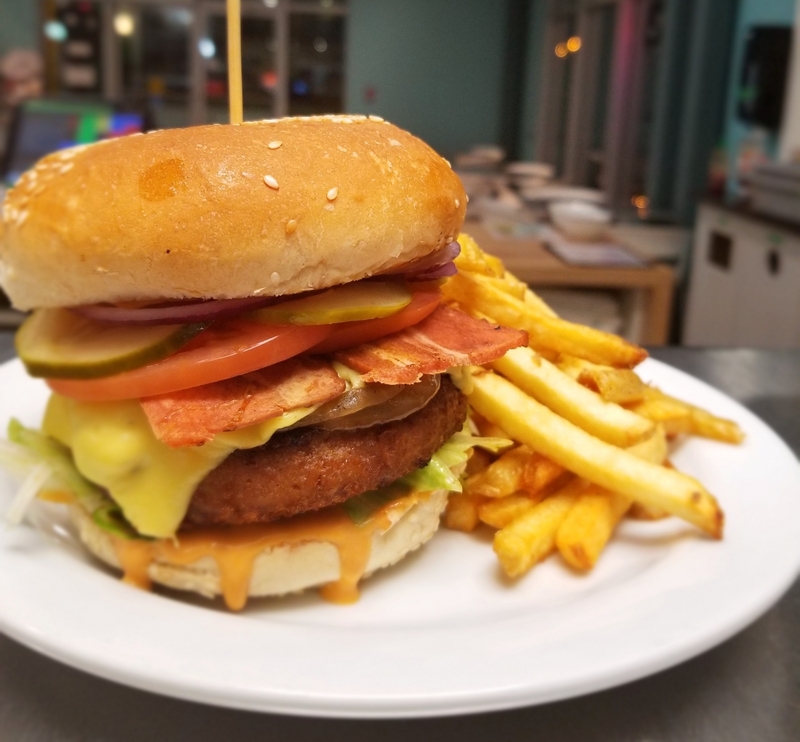 Its globally-inspired menu has a wealth of vegan options including six different variations on the Beyond Burger. You can try The Usual for $14 (lettuce, tomato, onion, vegan garlic mayo, ketchup), the Cheezeburger for $16 (all the above plus vegan cheese), the Beyond the Beyond Burger for $17 (mushroom “bacon,” caramelized onions, confit tomato, sweet garlic “aioli,” roasted beets and pickled cabbage) the Southwestern for $16 (pickled onions and cucumber, crispy shallots, barbecue sauce, vegan ranch), the Seoul Burger for $16 (Korean apple slaw, cilantro, green onions, peanuts, vegan mayo, gochujang) or the Piccante for $17 (vegan cheese, lettuce, guacamole, crispy shallots, jalapenos, barbecue hot sauce, vegan mayo). All items come with a side of your choice. As a bonus, you can order Beyond Meat brand chicken in both a blackened “chicken” dish and a street butter “chicken” dish. Note: The Street Eatery management team claims the honour of being first to serve the Beyond Burger starting when they opened back in 2016. Keep a close eye on its menu as Beyond options are always evolving. 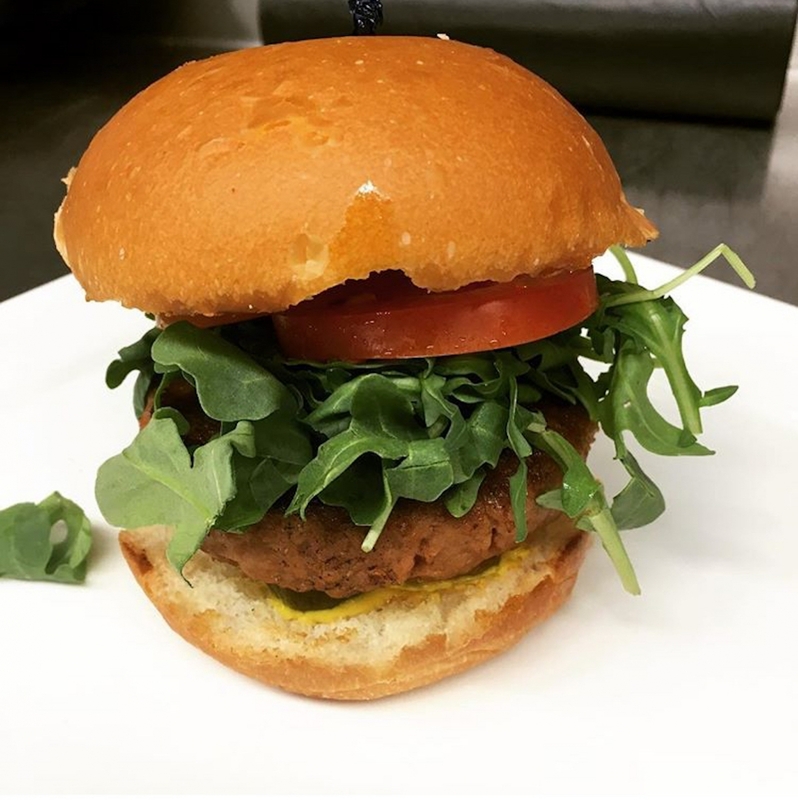 Veg-In uses Beyond Beef crumbles and Beyond Chicken rather than a traditional Beyond Burger patty. Photograph by Colin Gallant. 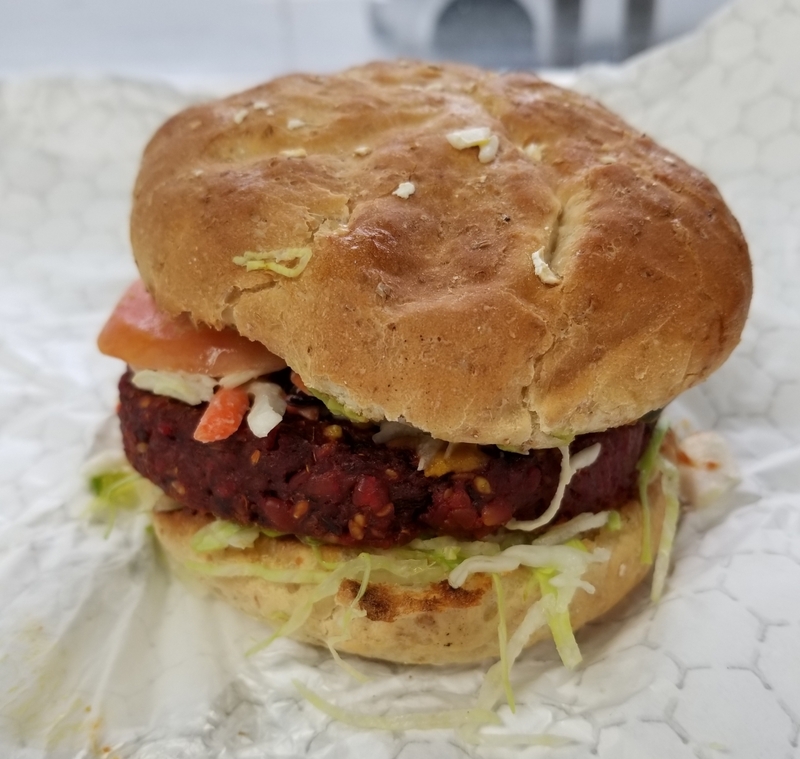 This vegetarian and vegan restaurant serves a $12 Manhattan burger with a patty made from the Beyond Meat beef crumbles, Beyond Chicken, beets, sesame seeds, rice, onion, garlic, ginger and spices. It is then topped with edamame, sesame seeds and cashew cheese, lettuce, tomato, pickles, house slaw, onions and your choice of sauce. 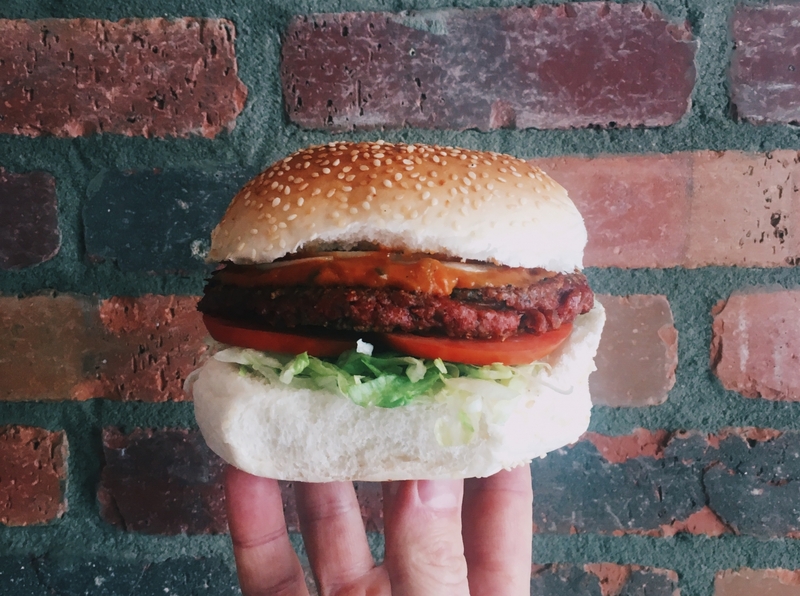 While it doesn’t feature the actual Beyond Burger patty, its use of other Beyond Meat products and massive portion size are enough to land it on this list with our enthusiastic recommendation. Notable Veg-In YYC diners include rapper RZA of the Wu Tang Clan and Billy Corgan of the Smashing Pumpkins (whose picture is on the wall).